As you guys know, I’m a big fan of spices. Greensboro is lucky enough to have the ultimate spice source at Savory Spice Shop in Friendly Center. Just this weekend I stocked up on good Mexican vanilla, truffle salt, sweet and spice paprika, cumin, Himalayan sea salt and an interesting Cuban spice mix. It’s a lot of fun to explore and get to know Ashley and Clayton, the local spice experts. 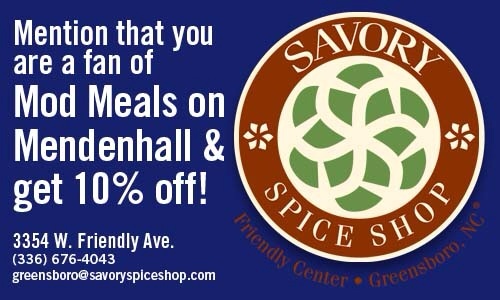 So, spice up your summer with a trip to Savory Spice Shop. Mention Mod Meals and you’ll get a boost!